An electrical worker in Alaska was able to capture footage of a local resident’s dog wrestling with a polar bear and amazingly enough actually winning the encounter. Christopher Miller said he arrived for a job when the owner of a property asked him if he would like to see a polar bear. 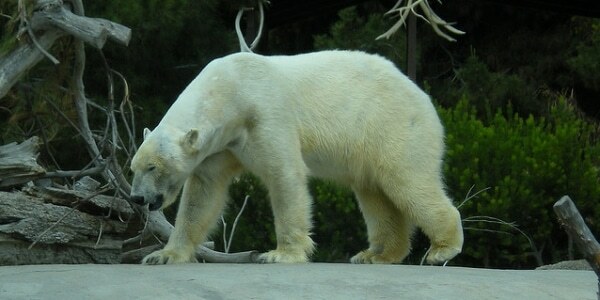 Mr Miller than followed the individual to his house where he came across the resident’s dog tussling with a polar bear. If you watch the footage you will see the dog chase and nip at the bear who attempts to fight back by trying to bite the dog. Fortunately for the canine the polar bear misses and the dog was unharmed. According to Mr Miller, the property owner then fired a couple of warning shots into the air, but that didn’t scare away the bear and the dog completed its goal of chasing away the bear from the property. Mr Miller thinks both polar bear and dog were simply playing since neither walked away injured from the encounter. He believes the polar bear and dog know one another and were simply looking to play because if a polar bear decides it really wants to attack, then they are going to do it and there absolutely is no way a dog could survive. Residents of the area have said over the last few years there has been an increase in polar bear sighting which itself has resulted in a large number of tourists flooding in as they seek to catch a glimpse of the Earth’s largest land carnivore. Over 2,000 tourists flocked to the small town of Kaktovik with its population of 200 in 2017 which is staggering compared to the 50 visitors a year the town had in 2011 and the years that preceding it.